I am in desperate need of stamping time, lol. I just received my order where I bought just about everything in the holiday mini and I just want to sit and play all day, but life isnt allowing it. I did make time in my afternoon though to play along with this weeks Freshly Made Sketches challenge. I just love the clean and simple sketches they are posting! I whipped out the new Spice Cake DSP for this card. I love this DSP! Usually I'm all about the Christmas DSP but the Spice Cake paper is totally worth stocking up on...such pretty colors and designs! Because I picked out some of the papers with a busy design I wanted to keep my main image pretty simple. I love the Leaves Of a Tree stamp and originally started with that but it didnt look right with this paper, so I ended up using the very versatile tree from the Thoughts and Prayers set. I got this set a few months ago and it quickly became one of my favorites, as you can use it for so many things. The sentiment is also from the Thoughts and Prayers set and again, I kept it nice and simple. Wow I am taking my tree out right now! It looks great with Spice Cake! Love this! I really like the fall look of this card. You did a wonderful job with the sketch and your card is just beautiful. LOVE this card! You used some of my fave stamps and dsp!! Oh, this is lovely ... that tree looks spectacular in the matching colours of the paper ... great job! I am so happy you are enjoying my sketches! Thank you!!! 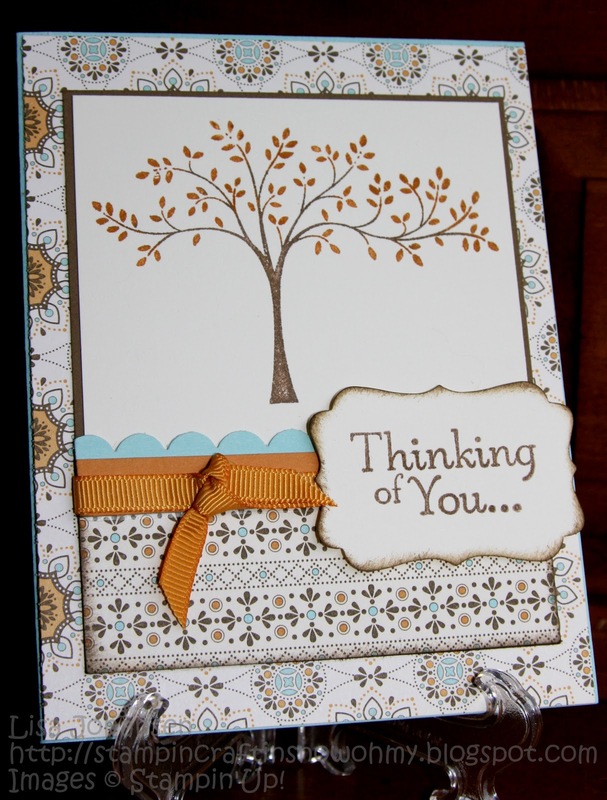 Your card is lovely, the way you used two tones on the tree, the simple bow and the use of the decorative label punch all make for a lovely thinking of you creation! Thanks for playing at Freshly Made Sketches. I love the Thoughts & Prayers with the Spice Cake DSP and the little peek of Pool Party in the scallop border. Very well done! Thanks for sharing with us at Freshly Made Sketches! I love this paper too. I just got it, so I'm anxious to get crafty with it! It looks fabulous with that tree! Thanks for joining us at Freshly Made Sketches! Oh, this is so pretty and I love that tree colored like that! Beautiful use of the sketch! So glad you joined us at Freshly Made Sketches this week! 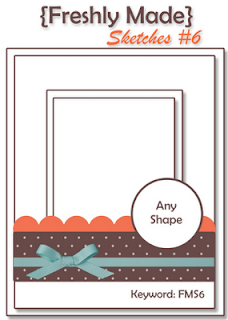 This is so clean and fresh, perfect autumn card! Great combination of image with the paper! Thanks for joining Freshly Made Sketches this week!